Sky Blue Radio - Oz Flight Sim Expo 2018 announces Dates and Venue! 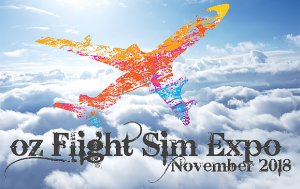 Oz Flight Sim Expo 2018 announces Dates and Venue! The Oz Flight Sim Expo is the only event of its kind in Australia bringing the local Flight Simulation Community together to experience the latest and greatest in Flight Simulation technology. From the flight sim beginner right through to the most experienced and dedicated enthusiasts, the Oz Flight Sim Expo has something for everyone. The main Hangar at HARS will provide a perfect backdrop to showcase Flight Simulation products. Bringing the Oz Flight Sim Expo to HARS makes it a recipe for “Avgeek” heaven, with the Expo covering the Flight Simulation Hobby, and HARS having their aircraft available for tours, this year the Expo has something for every Aviation Enthusiast. This year, the Organizers are planning to host Australia’s largest Flight Sim Meet. Flight Simmers from all over Australia and the Pacific/Asia region are invited to participate in flying their favourite flight simulation using their own equipment. “This year’s Oz Flight Sim Expo promises to be a fantastic event with amazing displays, product demonstrations and online flying workshops” said Deputy Event Director Daniel Hammond. The Oz Flight Sim Expo invite local and international companies with an opportunity to showcase the latest and greatest flight simulation products. Sponsorship and Exhibitor packages are available, and the Event Team are now accepting Expressions of Interest. Packages can be tailored to suit your requirements and prices are negotiable. Look forward to seeing you at the HARS Main Hangar at Illawarra Airport in November.